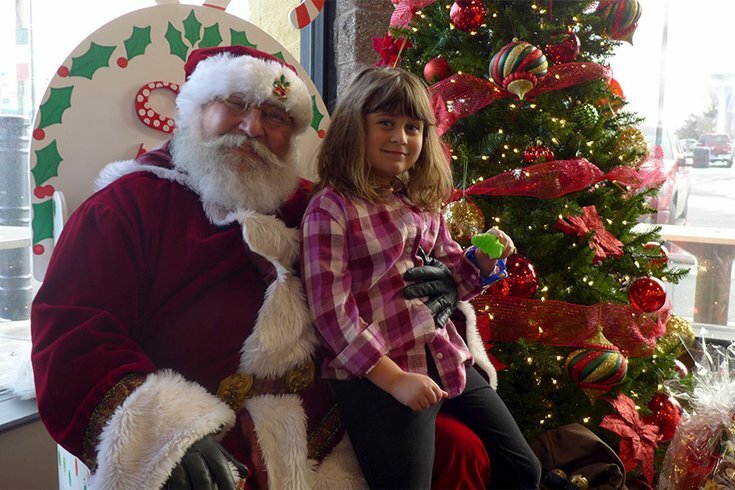 Madelyn Prybylski, 6, of Perkasie, Bucks County, told Santa what she wanted for Christmas in December 2017 at Altomonte's in Doylestown. 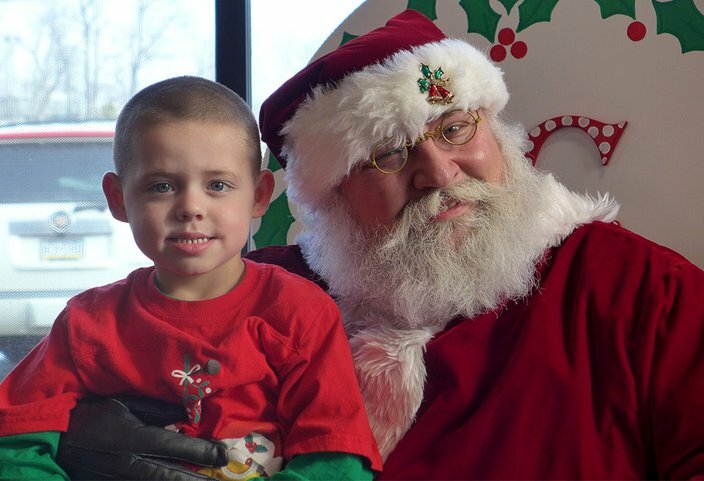 Frank Naimoli never intended to become one of the busiest Santas in the Philadelphia region. But what started as a playful, family gig two decades ago now brings him into the homes of strangers every Christmas Eve, when he allows kids to catch Santa delivering their presents during a so-called "Sneak and Peek." More often than not, the children are thrilled by the sight of Kris Kringle munching on their cookies and placing gifts beneath the Christmas tree. But once and a while, even Santa Claus gets a surprise. MORE NEWS: Are you breaking Philly law with your Christmas tree? "One father who did it, he said he thought it would be the greatest thing in the world," Naimoli said. "He woke up the little ones. ... They all snuck down the steps. The smallest one looked, let out a blood-curdling scream and ran back up the steps, to the point where I almost had a heart attack." Naimoli, 48, of Glenolden, Delaware County, makes dozens of private appearances every holiday season. But make no mistake – he's no mall Santa. His appearances begin with family photo shoots in November and peak with his Christmas Eve visits. In between, there are numerous office parties, hospital stops, family gatherings and public events – from South Philly to Jenkintown, from Reading to Collingdale. Next year, he's even going to officiate a wedding. "It's a whirlwind couple of months" this time of year, said Naimoli, who also works as a security guard. "I leave the house at 7 in the morning, sometimes getting home as late as 11 at night. I'm putting hundreds of miles on the sleigh. In between events, I actually sleep in the car, eat in the car." Her smile glowing, Alex Catalano, 9, of Doylestown chatted with Santa at Altomonte's Italian Market in December 2017. Santa's sleigh, by the way, is actually a red Prius with a custom license plate that reads "ON COMET." And he's been known to stop for photos – even when he's almost run off the road in the process. "I call it the red light picture," Naimoli said. "If you look out a window and see a bunch of little ones smiling and jumping up and down – I just can't drive away. I never turn down a photo." After all, if Santa drove away, that might erode some of the magic Kris Kringle shares with the children. And Naimoli is all about playing the part of the jolly good fellow. To start, he owns five Santa suits, including a 1950 outfit from the C.W. Howard Santa School in Michigan, the world's oldest Santa Claus school. He also has spent hundreds of dollars on a custom-made belt and a pair of suspenders equipped with bells. And the beard? It's real, of course. As a member of the International Brotherhood of Real Bearded Santas – yes, that's a thing – Naimoli wears a full beard that he dyes white and treats with oil that smells like candy canes. As authentic as his appearance may be, you get the sense his Santa-ness, his instant rapport with young and old alike, comes not from the hat, but the heart. 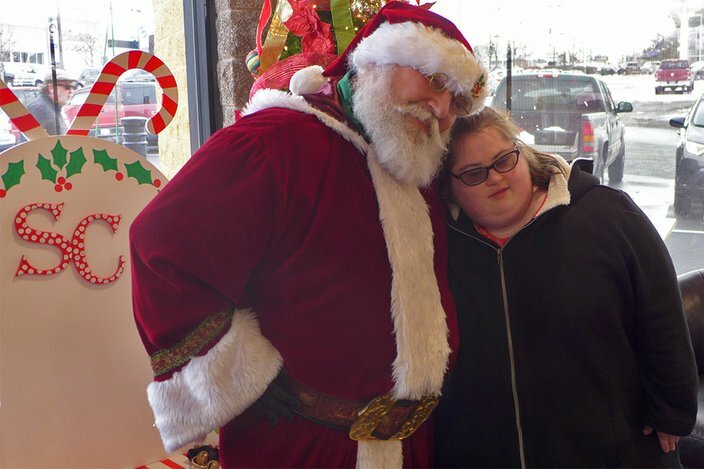 Santa hugs a big fan, Lauren Sims of Doylestown, who stopped in last December at Altomonte's Italian Market with her family. On yet another appearance, this one on Saturday at an Italian market in Doylestown, the children sat on his lap as he regaled them in a gentle tone with stories of elves and Santa history – and his Naughty-or-Nice meter. 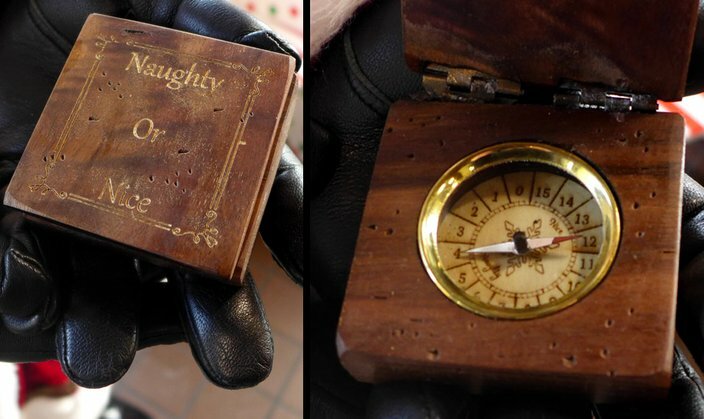 The Old World contraption – which bears a certain resemblance to a compass – works via a magnetic needle, a dial of numbers from 0 (most naughty) to 15 (most nice) and a bit of Santa magic. "Well, you have a 15," he told one grinning young girl, showing her the dial. "That's the first 15 I've ever seen." Indeed, the little ones were scoring very high on Santa's meter that day, much to their delight. "Some of the best reactions are from the babies," Naimoli said. "A lot of times, it's the first time they've seen a big fluffy, white beard, so they grab it. The next thing you know, you have a baby swinging from your beard." Over the years, Naimoli has received thousands of notes from children asking for all sorts of Christmas gifts. He refuses to throw them away. "I always thought that they put a lot of work and thought into that letter," Naimoli said. "For me to just discard it, to me, would be an injustice." Between the notes and appearances, Naimoli has received all kinds of requests from children over the years. Animals are a popular request. Every year, somebody asks for a monkey, he said. And people have put everything from alligators to rhinos on their Christmas lists. "Last year, I had a young man ask me for a sloth," Naimoli said. "Apparently, he has a dog – but the dog is always running around. He has to take it out and he wanted something that he didn't have to chase." Another time, a child asked for a snowplow so he could pile all the snow in front of his school. That way, he figured, it couldn't open. "One thing is, you don't promise anything. I was pretty sure I could deliver on that one." Danny Wilson, 5, of Hatboro, sits on the lap of Santa during a December 2017 visit to Altomonte's Italian Market in Doylestown. But occasionally children make requests that Naimoli knows Santa definitely cannot deliver – to heal a sick family member, friend or pet. And those are the toughest ones to handle. "How do you do it without breaking the little guy or gal's heart, you know?" Naimoli said. "I'm a softie. I can't hurt anybody's feelings. ... I say that I can't make him well, but you and I can maybe spread a little Christmas cheer to him. I explain to them that that's what Santa Claus does – that's the Christmas spirit." Sometimes, Santa unknowingly delivers some of that Christmas spirit. One year, Naimoli was taking photos at a credit union near Reading with a woman and her grown daughter. He laughed as the woman told him how much she enjoyed candy canes as a young girl. About 30 minutes later, the two women returned for more photos, this time with a second daughter. "The girls were ecstatic just to get these pictures," Naimoli said. "After they had left, one of the staff came up and told me that the mother was just diagnosed with terminal cancer. She doesn't have a lot of time left. "I would have never known it from how much she was having fun and bringing joy. Then it hit me, because I took that photo with her. I'm probably going to be the last Santa she ever had a photo with. It puts everything back into perspective." About three years ago, Naimoli visited a nursing home where many residents suffered from Alzheimer's disease and didn't understand why they were living there. But when Naimoli began leading them in "Jingle Bells," they all began singing along – even remembering a few obscure verses. "The nurses had a shocked look on their faces because they couldn't believe they remembered the words," Naimoli said. "It was a beautiful moment because you realized the memories that they had just came back to them. They kind of shined. "To me, it was a true Christmas moment." Santa displays his Old World Naughty-or-Nice box, which indicates whether the girls and boys who visit him have been good this year. While Santa can get all sappy, he's not afraid to play some reindeer games. Sometimes, teenagers mistakenly think Naimoli is older than he actually is. They have tossed a few snowballs in his direction, not knowing he once dabbled in professional wrestling. "Quite a few times," Naimoli said, "They didn't know that Santa was able to throw one back at quite that speed." When adults tug on his beard wondering whether it's real, he'll playfully pull on their own beard and ask the same question. Yet, Naimoli remains protective of the Santa Claus image, appearing only at events he considers wholesome. But with some reservations, he once appeared at a Hooters restaurant for a "Breakfast with Santa" event. "It was actually very well done," Naimoli said. "They had a nice breakfast. Besides the Hooters girls in their regular outfits, it went well. I did notice that there were a lot of fathers bringing their children to that event." On another occasion, he attended a bachelorette party – but with strict rules. "I don't allow alcohol in the photos or anything," Naimoli said. "You can imagine how it was when you had a bunch of bachelorettes that were a few cocktails into the wind. I did get two marriage proposals that night, which I thought was funny." But he usually finds himself entertaining children, seniors and families with tales of Santa's history. He'll quickly share Santa's age – 1,747 years old – or explain why he won't show children his reindeer. "My deer are only used to my elves and Mrs. Claus," Naimoli tells the kids. "If you scare them, they're going to run off and then I'm going to be here for two weeks." Such questions often come up at his "Santa Q&A's" – events where children are free to fire off any question at Old Saint Nick. So, if you've ever wondered what Santa Claus does after delivering toys to children across the world, Naimoli offers a hint. Father Christmas – or at least the version portrayed by Naimoli – collapses into bed. "I get home from Christmas Eve and – nine times out of 10 – I don't get the suit off," Naimoli said. "I'll wake up in the middle of the night and take it off."